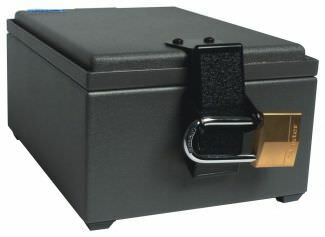 Tamper-proof hardware and a padlockable latch prohibits unauthorized access and maintains the chain of custody for the devices collected. When opened, the steady-hold hinge maintains the cover position where it was left, making it easy to load, unload, and latch the enclosure. And don't be confused by its small size, once on-site, nearly two dozen smart phones can fit inside one single STE2200F2! That's something the average pouch can't say! If you or your department is looking for an economical and compact highly isolated first tier collection or storage system, the STE2200F2 is your best choice. Thousands of departments can't be wrong! 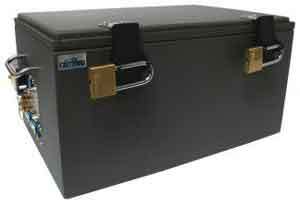 The STE2200F2 is designed specifically for securing and isolating cell phones and other small communications devices on-site for transport to your lab for evaluation and interrogation. 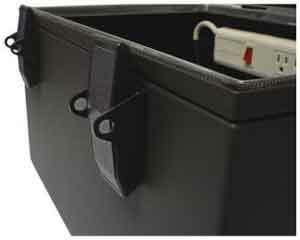 Its small size also makes it perfect for compact yet secured storage of one or more wireless devices. The moment the device is secured into the STE2200F2 it is isolated from the carrier's network, regardless of the carrier or the frequency bands in use by them. The device is also fully isolated from WiFi signal sources, including both 2.4 GHz and 5.0 GHz and therefore covering any combination of 802.11a/b/g/n/ac protocols. Once secured from outside signals, the device is protected from remote kill commands, remote lock commands, remote self-destruct commands, as well as being protected from GPS and location tracking. If a device is collected on site with our STE2200F2, when you return to your lab, it can easily be transferred into one of our larger forensics enclosures for a full forensics evaluation and interrogation. And while the STE2200F2 is primarily utilized for collection, our high speed USB2.0 Interface can be easily installed giving you direct connection to the device for both data access and battery charging while maintaining >80 dB isolation. This can be particularly useful to maintain device power to eliminate the threat of a power-down lockout or self-destruct script being executed. While compact in size, the STE2200F2 is constructed to the same precision-machined tolerances as our larger models in order to assure an exceptionally well shielded environment. 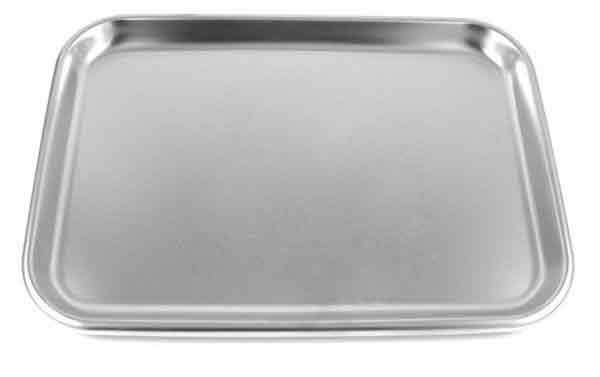 Heavy duty, rugged .090" and .125" aluminum is used throughout the enclosure. New for 2014 it also features our custom engineered GEN-2 RF gaskets. With over a year in the R&D lab, these new gaskets provide a previously unheard of and flawless RF seal while being immune to the fixed compression set of typical stainless gaskets. Likewise, also new for 2014 the STE2200F2 also features our GEN-2 RF absorbent and reflective foam lining. This foam was designed from the ground up, to our demanding specifications to provide maximum performance over all operating frequencies and bands. What does all this mean? A total isolation effectiveness greater than 110 dB, and the assurance that you're confiscated devices WILL be isolated from any network carrier out there! Standard RF reflective attenuation foam provides 20 - 30dB attenuation. There is NO connector panel, I/Os are machined directly into case. The STE2200F2 is provided standard without filtered input/output connectors for your custom applications. Filtered connector options are available in many configurations (See Connector & I/O Options). If your department is looking to join the countless others that have made the STE3000F2 the standard RF Test Enclosure in the forensics industry, give us a call. If you are interested an electronic documentation version of the STE3000F2, check out our STE3000FAV2. We provide the same visual and hands-on access, but add a high resolution video/audio recording system to record and time stamp your entire device interrogation. Just like today's public safety dashcams, the evidence is in the video! For nearly two decades, the patented Ramsey Electronics® STE3000 series RF Test Enclosure has been the wireless industry standard for a benchtop RF test chamber that provide both visual and hands-access to the device under test. As the term “cellular forensics” entered all of our vocabulary, it was natural that we also became the standard for that industry. The STE3000F2 was designed to give the forensics technician the equivalent of a highly isolated screen room right on his bench to perform electronic device interrogations. The term “cell phone” has long been replaced with “smartphone” and with that, hands-on access and control of the device became essential. The smart phone is now a communications command console that incorporates email, text and SMS messages, document storage, picture, image, and media storage, notepad, journal, and a host of other functions and services. And each of those services has a history that is critical to access during a device interrogation. 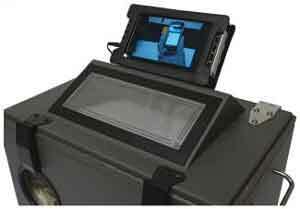 Once the device is inside the STE3000F2, you can view it through the LED illuminated RF tight window. You then have hands-on access to the device through our silver mesh RF tight gloves. Whether you need to open a device, swipe it, turn it on, touch screen icons, change pages… whatever you need to do, you can do, just as though the phone was in your own hands. After all, it is! 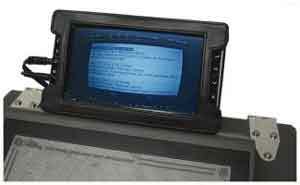 This also allows you to connect power, chargers, and USB data communications to the device for connection to your interrogation hardware and software... all while the device is maintaining isolation from the carrier’s network regardless of the carrier or the frequency bands in use by them. The device is also fully isolated from WiFi signal sources, including both 2.4 GHz and 5.0 GHz and therefore covering any combination of 802.11a/b/g/n/ac protocols. 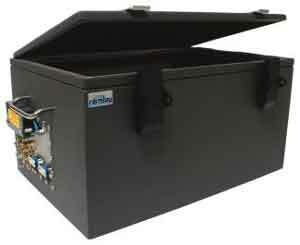 Just like our other forensics RF Test Enclosures, once secured from outside signals, the device is protected from remote kill commands, remote lock commands, remote self-destruct commands, as well as being protected from GPS and location tracking. 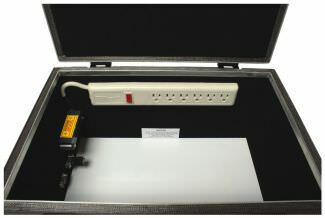 Once the device is transferred from the field to the STE3000F2, it can be charged with a standard 110VAC device charger using the built in RF filtered AC power strip. This can be particularly useful to maintain device power to eliminate the threat of a power-down lockout or self-destruct script being executed. As mentioned above, with hands-on access and real-time viewing, you can easily plug the device into an RF filtered USB interface to access it with your interrogation software. The STE3000F2 comes standard with our STEUSB2071 USB2.0 High Speed Interface, giving you full speed access to the device while maintain full RF isolation from the outside world. The STE3000F2 is designed around the same heavy duty, rugged .090" and .125" aluminum used throughout all of our enclosures. New for 2014 it also features our custom engineered GEN-2 RF gaskets. With over a year in the R&D lab, these new gaskets provide a previously unheard of and flawless RF seal while being immune to the fixed compression set of typical stainless gaskets. Likewise, also new for 2014 the STE3000F2 also features our GEN-2 RF absorbent and reflective foam lining. This foam was designed from the ground up, to our demanding specifications to provide maximum performance over all operating frequencies and bands. The STE3300F2 is designed specifically for storing multiple wireless devices in their powered-on state while keeping them isolated from the network carrier. 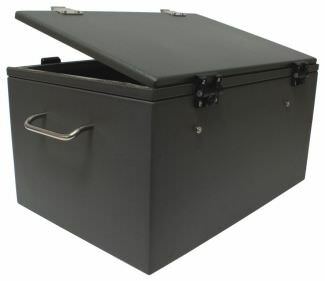 Its larger size makes it ideal for extended storage of department confiscated devices both before and after the forensics examination for what could be an extended period of time. Let’s follow a typical forensics time line. 1. A suspect wireless device is confiscated on-site. To protect it from real-time on-line executable booby traps (remote kill commands, remote lock commands, remote self-destruct commands, etc.) as well as device GPS tracing back to your location, the device needs to be immediately isolated from the carrier’s network. It also needs to be isolated from any available WiFi source. 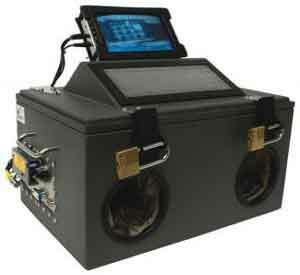 That can be easily accomplished with the use of our STE2200F2 forensics enclosure or STP1100 series forensics pouch. 2. 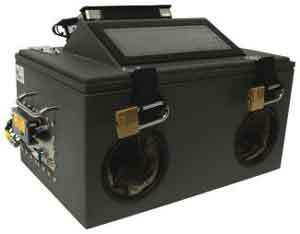 Once the wireless device has reached your lab, it needs to be made ready for your forensics examination. However, the device still needs to be totally isolated from the carrier’s network and WiFi sources. But now the device needs to remain powered up to eliminate the liability of a very possible power-down lockout, power-down self-destruct script, or other power-down loss of integrity. 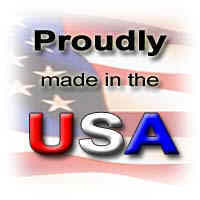 Therefore, the device needs to be plugged into a charger to maintain its powered-up status. If a forensics interrogation is scheduled soon, the device can be transferred to, and plugged into a charger in our STE3000F2 series RF Test Enclosures. 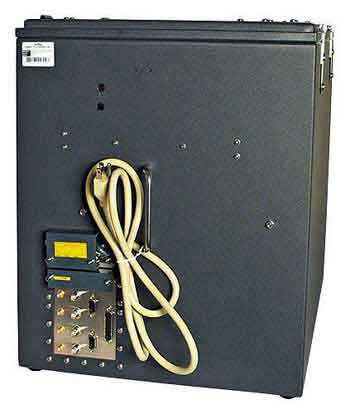 If the interrogation cannot be scheduled soon, and the device needs to be stored, it can be transferred into our STE3300F2 RF Test Enclosure, and connected to a charger to maintain its powered-up state until an interrogation can be scheduled. 3. 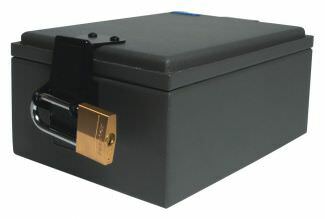 Whenever the interrogation is completed, if the device is to remain in custody, it can be transferred into our STE3300F2 enclosure, connected to a charger to maintain its powered-up status, and can be stored until further needed. At no time during this time line, was the wireless device exposed to the carrier’s network, a WiFi source, and was never in jeopardy of being blocked, locked out, or otherwise compromised by a network received or powered-down script. Enclosure wise, the STE3300F2 is a twin to our STE3000F2 and STE3000FAV2, without the visual and hands-on capabilities, and without the video/audio recording system. It is designed to provide you ample room for multiple device storage, while keeping them in a powered-on state for as required. Like its twins, it comes standard with a 6-outlet 110VAC outlet strip to accommodate any combination of device chargers and multiple port USB based device chargers. Six of our optional 4-port USB chargers can be easily plugged in to charge 24 various formatted wireless devices! Also like its twins, a USB2.0 high speed interface is also provided as standard equipment with the STE3300F2. This gives you a fully RF isolated I/O at full 480mbps USB2.0 speed to interconnect with any device inside the enclosure. This is perfect for connecting a suspect device, already in your possession, to your forensics software tools for further investigation and data dumps, all of which can be done without relocating the device in question. 2.4 GHz and 5.0 GHz, and therefore covering any combination of 802.11a/b/g/n/ac protocols. The STE3300F2 is designed around the same heavy duty, rugged .090” and .125” aluminum design of its STE3000F2 series twins. New for 2014 it also features our custom engineered GEN-2 RF gaskets. With over a year in the R&D lab, these new gaskets provide a previously unheard of and flawless RF seal while being immune to the fixed compression set of typical stainless gaskets. 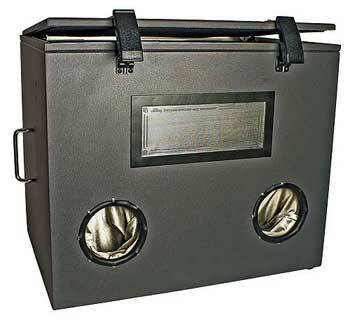 Likewise, also new for 2014 the STE3300F2 also features our ¾” GEN-2 RF absorbent and reflective foam lining. This foam was designed from the ground up, to our demanding specifications to provide maximum performance over all operating frequencies and bands. Therefore, you can be confident that any device in your possession will remain totally isolated from the carrier’s network, regardless of the carrier, make or model, operating system, or the frequency bands used. Likewise, the device will also remain fully isolated from any WiFi signal sources, including both 2.4 GHz and 5.0 GHz, and therefore covering any combination of 802.11a/b/g/n/ac protocols. 3/4" Standard RF reflective attenuation foam provides 20 - 30dB attenuation. The popularity of the STE4400’s larger size along with the patented hands-on manipulability of the STE3000B brought you the STE4500! 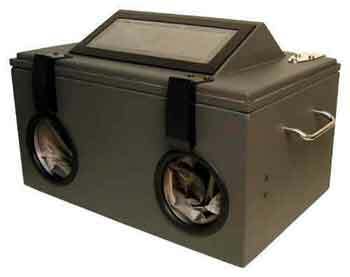 The exclusive RF tight hands-on silver mesh gloves and illuminated viewing window are integral to the large 22.5”W x 18” H wide front of the enclosure. 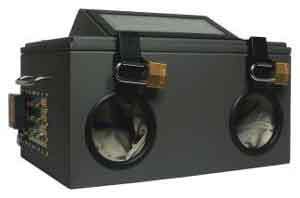 Dual gas filled struts hold the hinged top open for easy access for the largest devices, including laptops! Like other STE series enclosures, a universal stainless steel I/O connecter interface plate is used to provide you any combinations of “custom” milled connectors and I/O’s that you may require. Standard RF reflective attenuation foam provides 24 dB attenuation.